Sort of wishing we could spend one more day in Dallas, but feeling the pull of the road, we departed the city about 8:30 this morning, headed due south on I-35E. Interstate highway 35 stretches from Laredo, TX, on the Mexican border to Duluth, MN, on Lake Superior. In the past, numerous interstates had E-W or N-S divisions as they traversed the country. Now, I-35 is the lone holdout. The highway splits into I-35 E and I-35 W as it passes through two sets of twin cities—St. Paul and Minneapolis and again through Dallas and Fort Worth. ELLIS CO. 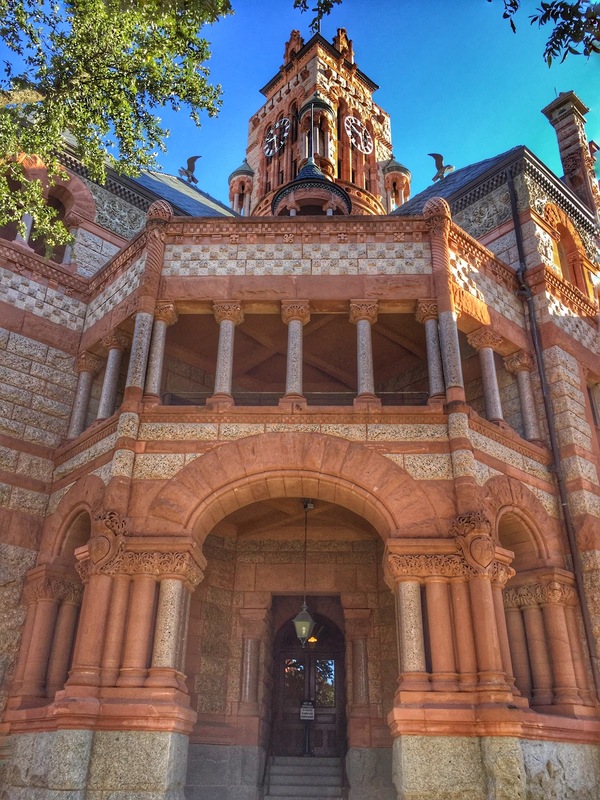 COURTHOUSE IS CONSIDERED A FINE EXAMPLE OF RICHARDSON ROMANESQUE STYLE. Thanks to our desire to chase letterboxes and roadside attractions, freeway driving did not deprive us of all the interesting places along the way south. Places like Waxahachie, TX (pop. 29,621), the county seat of Ellis County. 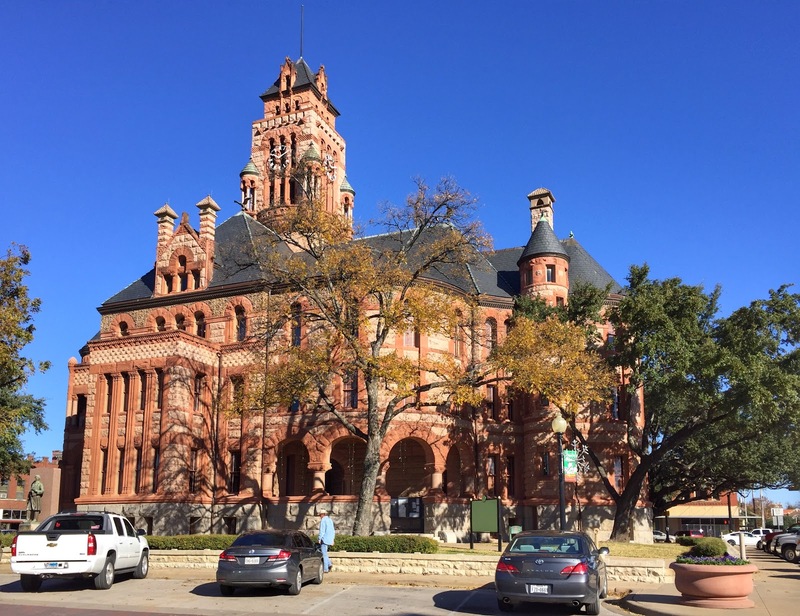 Revered as one of the grand old courthouses of Texas, the Ellis County seat of government was completed in 1897 of gray and pink granite trimmed with Red Pecos and cream colored sandstone. The massive building with its nine-story clock tower dominates the town square. Legend has it that the chief sculptor and stone mason for the courthouse fell in love with a local beauty, who was the daughter of the artist's boarding house landlord. 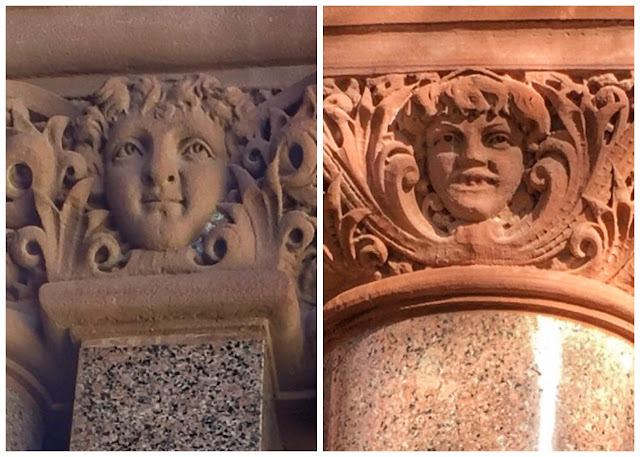 So enamored was he that he began carving her lovely face as decorations on the building. When she spurned his affections, the sculptor allegedly became embittered and his unrequited love was reflected in transforming subsequent carvings of his would-be paramour as hideously unattractive. 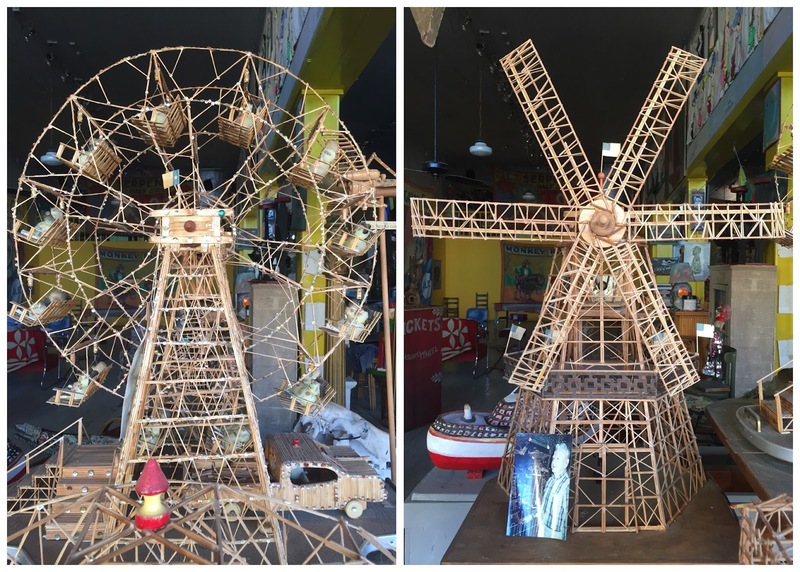 THE FERRIS WHEEL ALONE INCLUDES MORE THAN 10,000 TOOTHPICKS. Another Waxahachie artist created designs not with sandstone but with toothpicks. Before his death in the late 1990s, Venzil Zatoupil created a landscape of mechanical sculptures using hundreds of thousands of toothpicks of various types, matchsticks, and uncounted bottles of glue. Zatoupil's children wanted his works to be exhibited in a museum, but none could promise to keep them on permanent display. That's where local gallery owners Bruce and Julie Webb came in. As good as their word, they have kept the masterpieces visible and lighted in the window of their storefront Webb Gallery just off the town square. 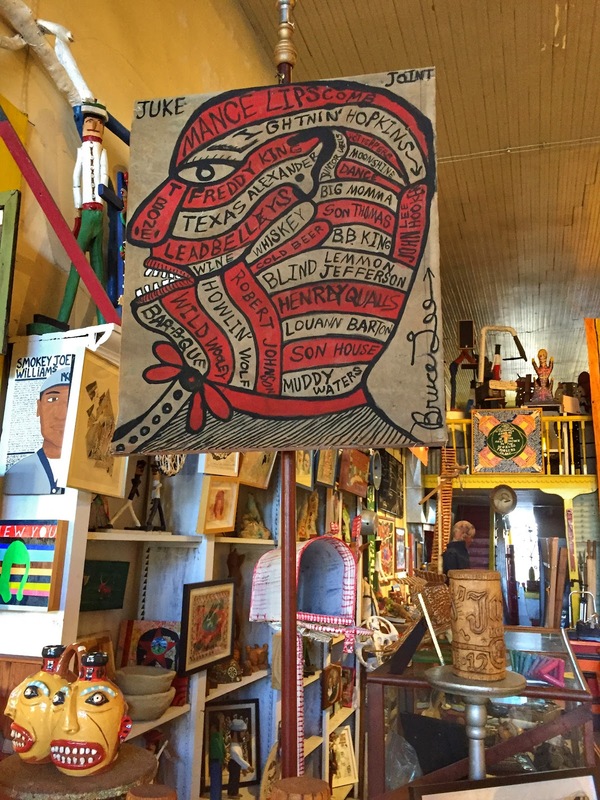 As we were peeking in the windows at all the other folk art and antique posters and banners in the gallery, the gracious Julie Webb was kind enough to open the door and invite us in to look around. Though the studio is open only on weekends, she happened to be in the shop preparing for a meeting. We admired their fabulous collection of eclectic pieces by "outsider" or self-taught artists and exchanged stories of travel adventures. 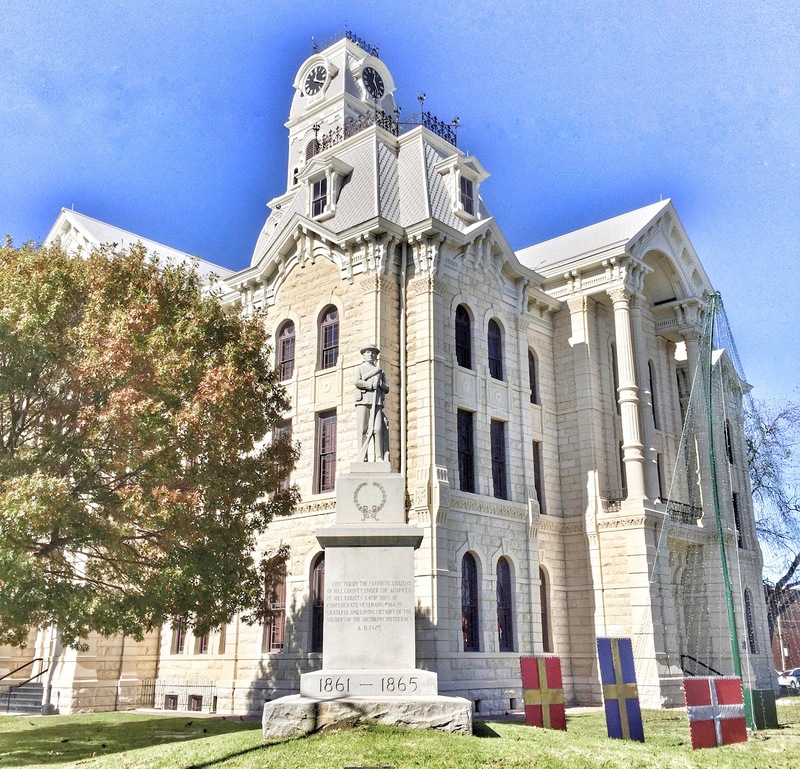 HILL COUNTY'S COURTHOUSE DISPLAYS THE TYPICAL CONFEDERATE MONUMENT ON ITS LAWN. Further west we stopped in Hillsboro (pop. 8,456) in search of a letterbox. At the center of town, the three-story limestone Hill County Courthouse gleamed in the noonday sun. Completed in 1890 at a cost of $83,000, the impressive Second Empire style landmark was gutted in a massive fire on New Year's Day of 1993. Though only the exterior walls remained, local citizens were determined to rebuild, and one of their own stepped in to help, as only he could. Hill County native Willie Nelson organized two benefit concerts to raise funds for the restoration. 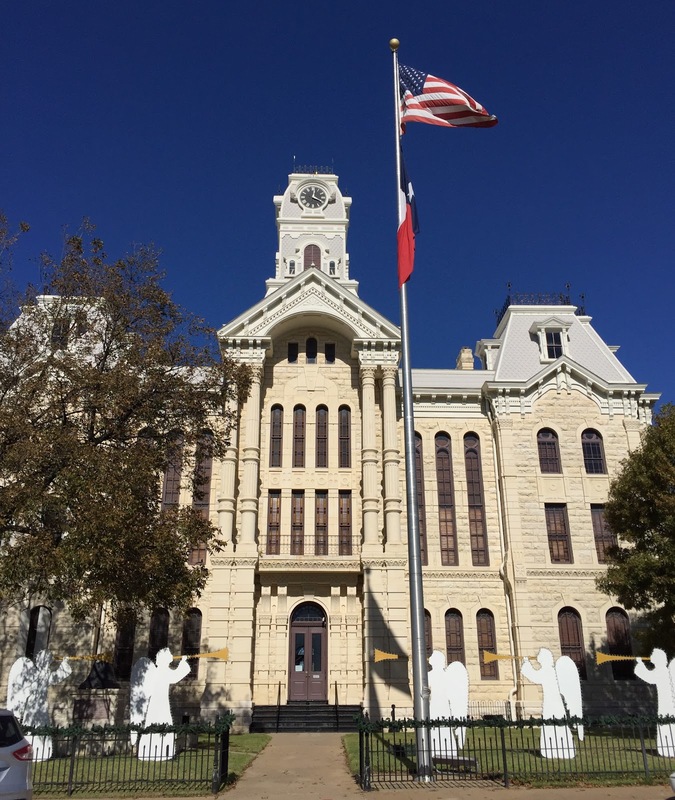 Six years and $9 million later, the courthouse was rededicated in a ceremony with Gov. George W. Bush as keynote speaker. Since we were so close to Willie's hometown of Abbott (pop. 356), we couldn't resist popping in to see where the roots of this country music legend took hold. Abandoned by his mother and then his father, Willie and his sister Bobbie were raised by their paternal grandparents in Abbott. Mail order lessons set both on the road to music careers, and their first performances were at the Abbott Methodist Church, a humble white clapboard building with a shake shingle steeple. THE NELSONS TOOK WILLIE AND BOBBIE TO WEEKLY SERVICES AT THE CHURCH. 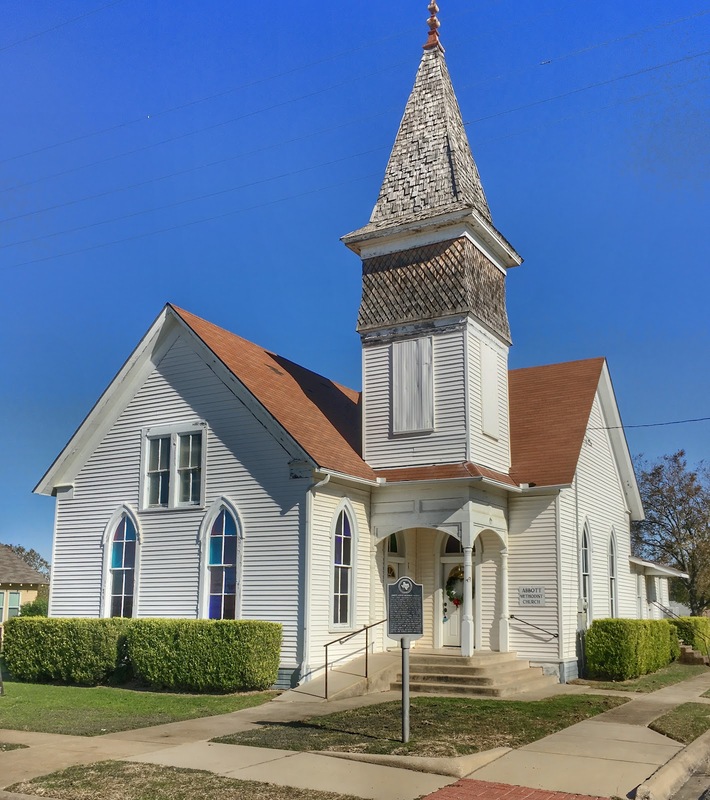 Abbott's population dwindled over the years, and by the early 2000s, the minuscule membership at the Nelsons' home church was no longer able to support the church. The Methodist organization closed the church and merged the local congregation with that of the larger Hillsboro church. A childhood friend notified Willie Nelson that the church building had been put up for sale, likely to be moved to another location or demolished. Willie again stepped up to the plate, bought the church for more than the asking price, and paid for restorations. In July, 2006, Willie and Bobbie rolled into town on tour buses to attend the church's re-opening service. 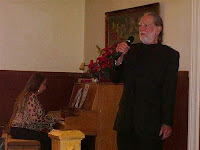 The small chapel was packed with locals and visitors who came to hear the siblings—with musical friends such as Leon Russell and the Willie Nelson Family Band—perform many of the gospel songs they had sung there as kids. Willie (R) even dressed in his Sunday best for the occasion. (Photo from www.willienelson.com). With another heartwarming story of Willie's devotion to his homeland behind us, we continued south on I-35 toward Austin, which also claims him as a favorite son with statues and street names. Before we arrived, our attention was claimed by a brown National Park Service sign announcing the Waco Mammoth National Monument. SIGN AT THE ENTRANCE CONFIRMED WHAT WE'D SEEN ON I-35. Even with our limited knowledge of paleontology, we were a bit surprised to discover that wooly mammals had lived in the area we now know as Texas. Then again, this was Texas. Maybe mammoth referred to the size of the national monument. 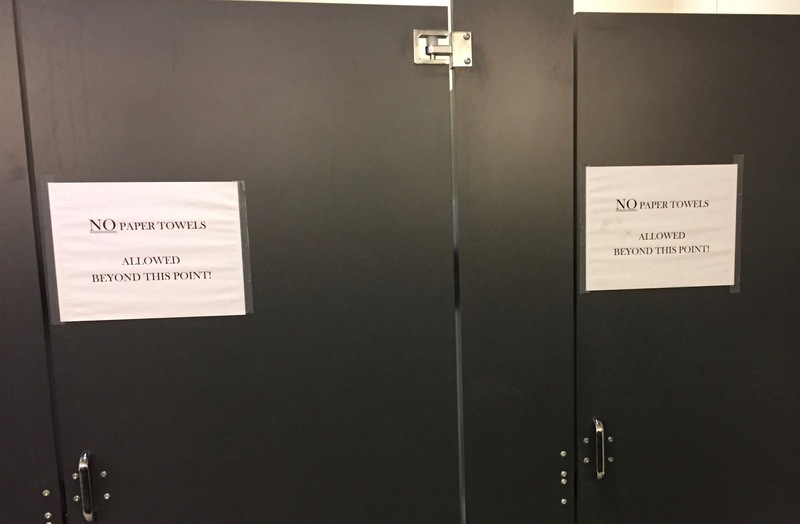 Either way, we were intrigued enough to leave 35 to investigate. EXCAVATION IS STILL NOT COMPLETE AT THE SHELTERED SECTION OF THE SITE. What we learned was that in 1978, some teenagers were searching for Indian arrowheads and spear points in a ravine near the Bosque River north of Waco. Much to their surprise, they found instead a three-foot bone. Scientists at Baylor University, where the bone was taken identified the specimen as the femur of a Columbian mammoth, which inhabited North America until its extinction about 10,000 years ago. CAMEL REMAINS FOUND AT THE SITE SUGGEST A SYMBIOTIC RELATIONSHIP WITH THE MAMMOTHS. A team was organized to examine the site of the find, and for the next twenty years worked to excavate what became known as the Waco Mammoth Site. What they uncovered was a nursery herd—sixteen adult females and juveniles—who appeared to have drowned together in a single event about 70,000 years ago. Further investigation turned up more mammoths along with remains of additional animals of the period. Various agencies including Baylor, along with state and local governments, have funded the project, including the construction of a climate-controlled building around one section of the bone bed. Just last year, the site was adopted as a new unit of the National Park System. THE DAVILA MONUMENT IS ONE OF TEN SUCH REPLICAS IN TEXAS. 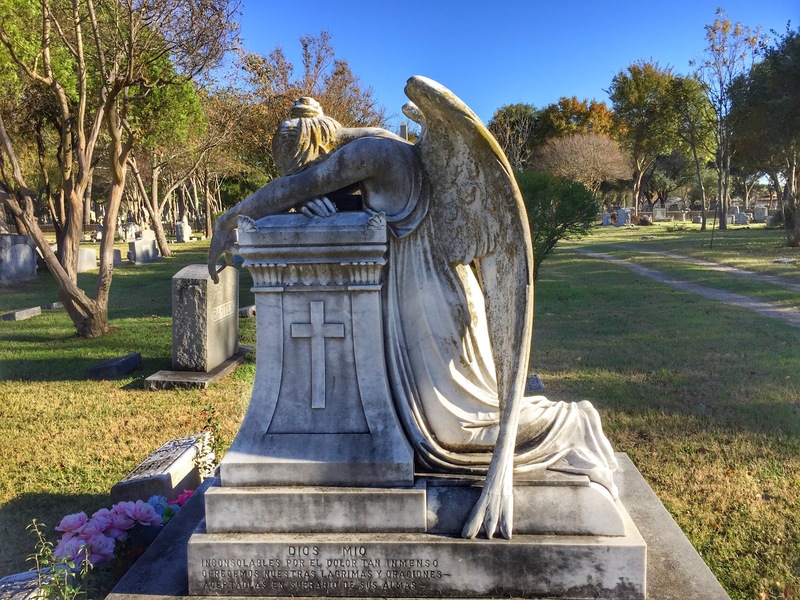 Since we chanced upon the Remillard Angel in Montreal in 2010, we have had a fascination for cemetery sculptures known as the Angel of Grief or Weeping Angel. Modeled after an original sculpture created by artist William Wetmore Storey for his wife's gravestone in 1894, replicas are now found throughout the world, including one at a Catholic cemetery in Waco. We were alerted to it by a letterboxer who placed a box there with a beautiful rubber stamp carving of the angel. As dusk was falling, we arrived at a Homewood Suites on the north side of Austin, happy they were serving a complimentary evening meal. Tomorrow we plan to visit the Texas State Capitol and other historic locations in the city. Loved: Visiting the hometown of Willie Nelson and learning about his acts of kindness to the place of his roots. Lacking: Historic or any other type of markers in Abbott referencing Willie, but then maybe that's the way he wants it. Learned: In Texas, as in other parts of the US, some small towns thrive, while others barely survive. ELLIS COURTHOUSE HAD LOTS OF INTRICATE ANTIQUE FURNITURE.